Although this was a strange story I enjoyed it very much! At the age of 9 Rose Edelstein discovered that she had an unusual gift. After taking a bite of food, she could actually “taste” the emotions of the person who prepared it. She could even tell you where the ingredients came from. 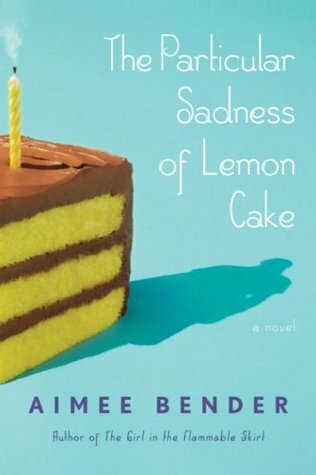 Imagine taking a bite into a slice of lemon-chocolate cake that your mother prepared and being able to taste the absence, hunger and emptiness she was feeling. Or take a bite of a sandwich and be able to taste the person longing, screaming to be loved. Understandably, Rose began to dread eating and found herself visiting the vending machines so she could eat food that had been prepared by machines as opposed to people with actual feelings. And this wasn’t even the strangest part of the book! Rose’s brother Joseph has an even stranger gift. Aimee Bender could certainly write an entire book about Joseph! I don’t want to even get into that story line, you have to read it to believe it. I enjoyed getting to know Rose and her quirky brother Joseph. I loved Joseph’s friend George. I wanted to know more about Rose’s father who could not step foot into a hospital, even to witness the birth of his own children and Rose’s mother, who appeared so cheerful on the outside. Yes, this book was entertaining yet it left me wanting more. I want to know more about Rose and her amazing sense of taste. I want to delve into Joseph’s strange (there’s that word again) behavior. Joseph’s story line popped up later in the book and left me with so many questions. This book was very thought provoking and would be a good discussion book. Check out Esther’s review of the book below!